How Do We Build and Maintain Context When All We Have Is a Backlog List? A lot of people, while they like the simplicity of the approach of maintaining a backlog, feel like they lose context when they just have a list of user stories. Others cannot think in terms of lists but rather need something more pictorial to help them understand what is going on. One approach that I have seen useful in these contexts is the use of “User Story Mapping”. The basic idea, made popular by Jeff Patton is pretty straight-forward. It is a top-down exercise to understand the workflow. The idea is to start with the activities a user / role needs to do to accomplish an objective / goal. Then detail out stories that represent the effort done by each user. Next, prioritize them into sprints (or whatever time horizon you are working toward). The activities can be based on larger features or epics coming into a planning session or perhaps are just something that needs to be elaborated. In this picture you can see blue user activities, the with stories required to support that activity in yellow underneath. You can see they have said “this is what will happen in the first increment” by creating swim lanes. These time horizons can be whatever makes sense in your situation. Perhaps a sprint by sprint view, perhaps a “Program Increment” view if working in a SAFe environment. 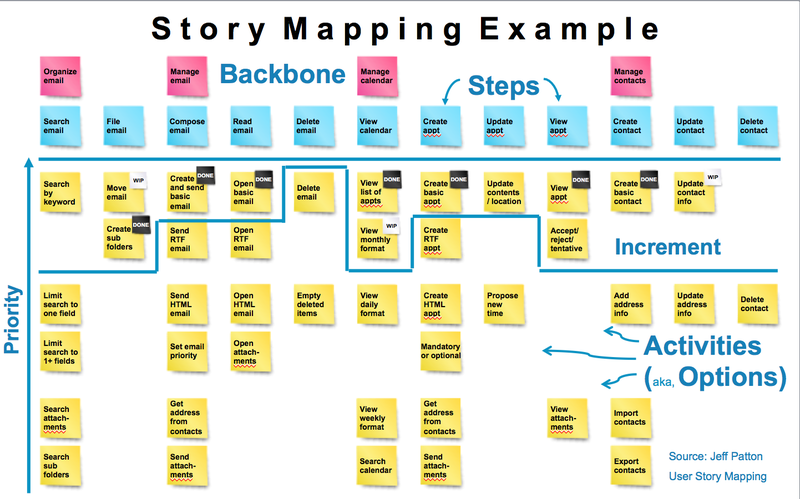 Another approach to story map is to take a bottom up approach – do a brainstorm of business activities, group into processes then map to the feature’s acceptance criteria. The approach you take will depend on your current level of knowledge. You can use this picture help others understand where you are and to maintain context. For example, you could mark on each story “done” as things are complete, and as you get feedback update / add items to the story map that you already have. It helps to identify areas that have been missed, filling in details as we learn more. It helps teams to maintain context. "User Story Mapping" - Jeff Patton. The canonical book on the overall approach.